Each Waterwheel Site Is Unique. We Custom Design Each Waterwheel To Accommodate Each Site. $1290.00 / foot in diameter. Price based on a two foot wide wheel. We have a number of options for coating a metal water wheel. We will thoroughly discuss your plans with you and recommend the best coating solution. Please see our section on Wheel Coating Options. 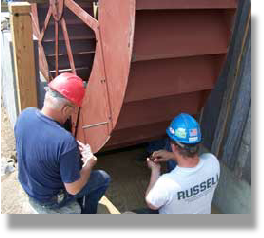 Site Installation: With water wheels that are eight feet or more in diameter, we suggest that we provide our personnel to help with the site installation. 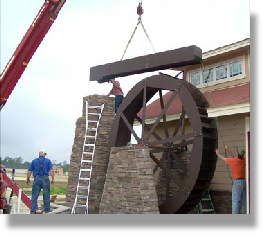 Smaller wheels generally can be assembled at the site and installed by your personnel. We cannot guarantee assembly if we are not there for the installation. Shipping: We ground ship throughout the United States. Our engineering associate in Italy is prepared to supervise assembly and installations overseas. We negotiate the best price and reliable logistics management for timely delivery of your waterwheel to your installation site. The Waterwheel Factory closely collaborates with Designers, Mill Owners, Architects, Property Developers, General Contractors and Property Owners on a personal basis to assure that each water wheel project is optimally managed from conception to final installation. Send us your buildings CAD drawings and we will work with them to include the details needed to support your waterwheel for you, your builder and permit office. We can design and manufacture what ever you can dream up. We use a full range of CNC machines that deliver aircraft quality fabrication in its cutting of your parts. We can cut any type of metal from Aluminum to Stainless Steel to meet your demands.